… that Kode9’s Sonar mix is the quality control dubstep is screaming out for. … that Appleblim “Vansan” (Skull Disco) is the one. 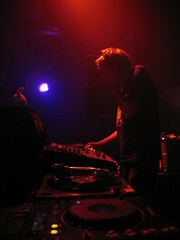 Hold tight for his mix on Mary Anne’s show. 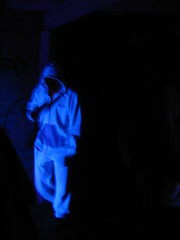 … that Pinch “Whirl” (unreleased) is broken Detroity 2step heaven, sent from Bristol. … that Skream’s “2D” was simply waiting to happen. … that Forsaken’s “Last Saloon Swagger ft. Joker and Ben Blackmore” is the biggest dubstep risk taken this year. …that Y.Dot “I Violate Because I’m a Sinner” from Y.Dot’s free mixtape is the first “refix” I’ve heard from grime in a while. … that Kano “Layer Cake” (679) hits nail pon head: “I’ll never sell more than an indie band… . Welcome to the layer cake son.” Oh and don’t forget “Be Real”. Over the years, I’ve really enjoyed getting to know London’s margins. While tourists traipse around - shudder - Leicester Square while staying in expensive Kensington hotels, it’s long since been the edges I’m most excited by. Over the years I’ve reached a fair few amazing places. I’ve sat in Jammer’s basement in Leytonstone, been to DMZ’s Dubsessions in Croydon and wandered down to Roll Deep’s base in Whilehouse. I’ve had football training in Dizzee’s old school grounds in Stepney and played matches on Hackney Marshes. I’d like to think I’m loosely familiar with most of the main culturally interesting margins of this city – Brixton, Green Lanes, Hackney, Tooting, Croydon, Brick Lane and so on. Except Southall. I’d never even been to Southall… until last weekend. I’d heard so much about the place, mostly from listening to Panjabi Hit Squad shows on 1Xtra. As my love of UK desi beats has grown, so has my curiosity about the place. So last Sunday I badgered some Sikh friends into giving us the guided tour of Southall. Southall sits in west London, not the gentrified or affluent areas of Notting Hill or South Kensington, but far further west, out into the suburban sprawl, as the same approximate radius from the centre as Tottenham (north), Norwood (south) or Newham (east). Since the 1950s it has been predominantly Asian area. 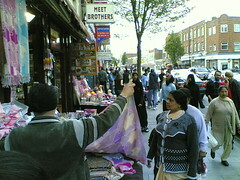 Our guided tour began, as it should, on Southall’s main street, The Broadway. 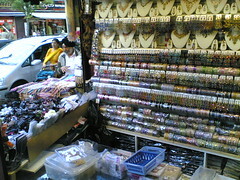 With one fabric shop after another, it’s riot of colour. To enter them is to be dazzled by rolls of material, in every possible shade, most bright. It reminded me of our friend’s Sikh wedding. While the men sat to the right in the temple, dressed mostly in suits, the women sat together on the left, their sari’s blending and clashing in an explosion of colour. While visiting somewhere new, there’s absolutely no substitute for guidance from an informed insider. Although many of the clothes shops looked loosely similar, our friends explained the transitions seen during their lifetimes. What was once exclusively the preserve of local family businesses, The Broadway cloth shops now share the footfall with boutique “designer” sari shops. As we wandered through a shop, our friend also pointed out the way to spot an Afghan turban from a Punjabi one – quite straightforward when you know what you’re looking for. In recent years Southall has seen large influx of Somali people too, which – with the usual differences in cultures and relative prosperity – has reportedly caused tensions. 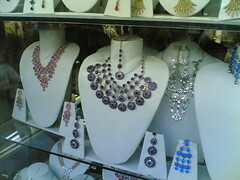 Other dazzling shops included amazing jewellery emporiums; widows decked dozens of vast, colour-themed necklaces. At the centre of another hung an immense gold… um… dress? Embedded with South African gold sovereigns, it was large enough to function as the (front) half of a short, yet admittedly very revealing, backless dress, if someone was strong enough to wear it. Failing that, it could have functioned as a kind of chain mail of sorts. As soon as lunch ended, we hit the shops again. Some cloth was bought but I had only one place in mind. 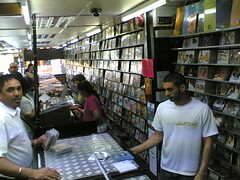 I’d wanted to hit ABC Music ever since I’d heard the tale that Timbaland has been taken there by Juggy D and they’d shut the shop so he could blow an insane figure on CDs. It was easily on par with Raj Deep’s in Tooting that I went to last year, in fact probably better. There was more upfront UK desi material, with that hip hop/bhangra edge I like as well as whole, accessible sections on Ghazals and religious music (both Hindu and Sikh). They were labelled (in English) so I didn’t have to spend so much time guessing the most rudimentary of information about them like: how many people are singing? Are there any other instruments? When is this from? My interest in Indian/Pakistani and UK desi beats doesn’t seem to have one focus, beyond the peerless Lata Mangeshkar (who poses her own kind of problems herself, by the nature of the size of her immense back catalogue… over 70,000 titles is it?). I still love the early Ghazals by her that my track “Lata” was sampled from, given how brittle and naked they are. I like a little current Hindi pop stuff, which tends on the whole to be quite sugary. The only one that has ripped my heart out is “Yeh Kya Hua” by Tera Mera Pyar. I like the strings in Bollywood tracks that swoop between tones, they can sound remarkably raw. But equally, lots of Bollywood “classics” do little for me, coming across as bad 1960s rock. 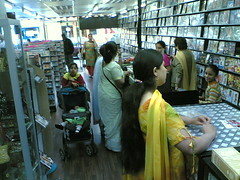 I also like the Punjabi desi stuff from the UK, especially the releases on VIP records. With its rolling layered drum breaks, it’s far more energetic than the Hindi pop stuff I’ve encountered. Finally there’s the whole world of qawaali’s, which edge into more abstract, extended-groove territories, but right now, while I have eight or nine Nusrat Fateh Ali Khan albums, they’re a bit like Fela Kuti LPs: the tracks go on forever, all sound very similar, they’re critically acclaimed but I’d rather not have to listen to them all. I’m sure this might change though. I was physically dragged out of ABC Music kicking and screaming… OK so not quite but it was a shame to leave (record shopping is not a spectator sport) and headed off to buy some jalebis. I have a very sweet tooth – sometimes I just spoon brown sugar out of the bag, yeah yeah… I know… and what?! – and Indian sweets satisfy it. 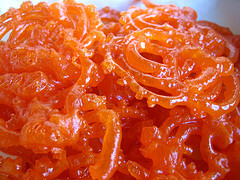 None more so than jalebis. In essence, jalebis are deep fried sugar. Health food they ain’t, but they taste amazing, with a soft gooey centre and crispy sugary outside. There are lots of types of other Indian sweets - gulab jamun which are soft damp cake balls served in syrup and others which are squares made from condensed milk – but to date jalebis are the ones that hit the spot. We headed off for Indian tea and desserts. First we passed Glassy Junction, a pub on the corner by Southall station that, legend has it, used to accept rupees as legal tender so that new arrivals to the area from India could still buy a pint. We headed on past the station and into another section of Southall that started to look increasingly Somalian, until we got to the Sikh temple, the Gurdwara Sri Guru Singh Sabha. It was opened four years ago and is said to be the largest Sikh temple outside of India. The first thing that strikes you about being able to build your religious buildings from scratch is the ability to accommodate modern needs. I hate to think what you’d find if you began excavating under most Christian churches, nor what would happen to the structural stability, but thanks to its award winning design, the Gurdwara Sri Guru Singh Sabha has a car park in the basement. Our friends lead us through the temple. Apart from removing our shoes and covering our heads, in practice there’re few restraints on access. Off the corridor sprang different spaces, like a function/wedding room with a lone practicing vaja player and a large canteen with stand up eating bays. We headed up to the first floor and into the main room. We found ourselves in an immense space under a dome. There was no furniture, allowing a huge area for people to sit on the large sheets spread out across the floor on one half or other. While I’m not religious, I felt really honoured to be there. While there were no physical or legal barriers to entry, the reality is I would never have entered the Gurdwara Sri Guru Singh Sabha without an invitation or a guide. It was very peaceful place, with live tabla, vaja and singing being performed from the front, and I reflected on why I enjoy experiences like it so much. We all live in this city, share the public transport and the streets, yet in many ways we live within contained within the bubbles of our cultures, peer groups, jobs, upbringing and routines. Stepping outside of it is surprisingly hard. Londoners don’t talk to strangers. To the Sikh’s praying, this was any given Sunday in the temple. To me it was a moment so out of the ordinary in my daily routine or experience. Living in London, a city that packs us all so near together on the tube, I’m consistently amazed how we can all live in close physical proximity yet there can be such large distances between our respective cultural understandings. The first time I think I remember feeling this sense of amazement was in 2002, when I first interviewed Dizzee. I can recall being excited by the unique UK language he used – now familiar to anyone’s who’s heard grime or a London pirate. Yet I also recall being concerned how, as the urban and rural divide grew ever larger, how the two sides would ever understand each other if their unique qualities were diverging. Now I realise it isn’t just the urban/rural divide, but an urban class/race/prosperity divide too. This is why I remain determined to try to cross these barriers, whenever I can. It’s for this reason that I decided, despite being very far west, that my Sunday should definitely include a mission across London to the House Party, squat rave. 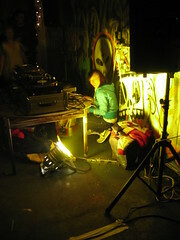 It’s only been a few months since the first dubstep squat party but given how fun the first one was, I couldn’t resist swinging by, not least because I got to cruise over the bit of the Westway that’s elevated and makes you feel like, amongst the skyscrapers, that you’re in Tokyo. When I arrived in east, I found myself undergoing a proper acid house/illegal rave ritual: wandering around staring at completely normal buildings, wondering where the party was. 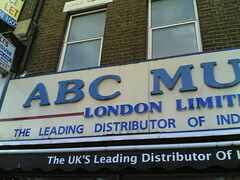 I’d been convinced it was at “16 Commercial Road”, which is near Whitechapel. If you look down the numbers on this road, as we did, from 30 and under, 16 seems to be somewhere on a massive roundabout. Or not. Only then did I check my email to find out the party was at 161 Commercial Street, which by car wasn’t too far away, but really not anywhere near the bland buildings I’d been randomly staring at. 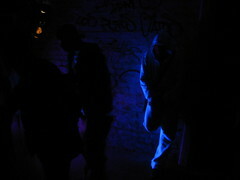 The House Party was pretty much what it said it was: a party in a derelict east London Victorian house, on three floors. On the ground floor there was a nice set of dancehall, Prince and jungle being dropped, not unlike Ripley might play. The DJ even had tattoos down her arms too, like Ripley. Both this room and upstairs had graffiti on the walls, with the top room covered in strange murals. From the windows you could see out over east London and by this time night had fallen. The crowd were a mix as ever, but with lots of the dubstep scene heads, students, ravers but without the squat/crusty vibe that was part of the Dubstep After Hours rave. I didn’t fall over any Mastiffs this time. Descending the rickety, damp and slightly soft wooden stairs lead you into a dark basement. Bits of dirt did indeed fall on your head and down your neck, probably aided by the fact that Chef and LD were filling the darkness with some deep bassline warfare. I stayed for a bit until a bloke let me know that only the night before, the stairs had collapsed. After a long, amazing day in London, it felt like time to leave. My Pitchfork column for May including interviews with Martyn, Appleblim, Plastician, Tanya and the Grime Reaper. For a selection of previous months columns, check this link.